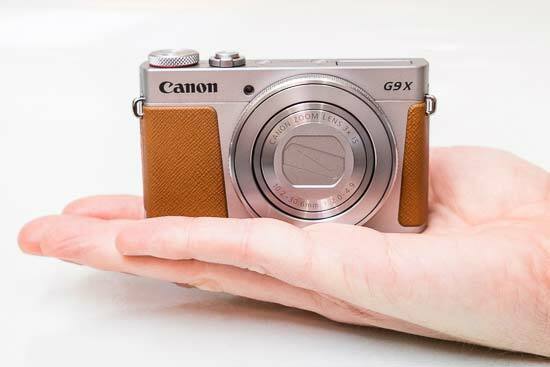 The Canon PowerShot G9 X Mark II is a new premium compact camera, featuring the same one-inch type, 20.2 million pixel CMOS sensor as 2015's original G9 X model. The Canon G9 X Mark II now offers a new Digic VII image processor, Dual Sensing Image Stabilisation with 3.5-stops of correction, 0.14-second auto-focus, new Auto ND filter, improved subject tracking and a maximum continuous shooting speed of 8.2fps in raw shooting mode. The new Bluetooth compatibility means you can maintain a constant camera connection, so you can see and share your photographs via a phone or tablet even when your camera is tucked away. Other key features of the Canon PowerShot G9 X Mark II include a 3-inch touchscreen, built-in Wi-Fi and NFC, full HD video recording, and a a 3x optical zoom with a maximum aperture of f/2.0 at its widest point. The Canon Powershot G9 X is available in black or silver/brown priced at £449.99 / €569.99 / $529.99. The Canon PowerShot G9 X Mark II looks essentially identical to its predecessor. It's a truly pocketable premium compact camera, and unless you've got ridiculously tight pockets, it should feel at home in most jeans or jackets. You can buy the G9 X Mark II either in black or silver. The silver version is part textured with a tan coating (the black version has a black texture), which gives it a retro and stylish look. Although there's no raised grip, the texture helps give you purchase, while there's an ever so slightly raised thumb rest on the back of the camera too. On the top of the Canon PowerShot G9 X Mark II there's a power on/off button, a playback button, the shutter release, which is surrounded by a zoom switch, and a mode dial. The mode dial contains 9 different exposure mode options, including manual, aperture priority (Av), shutter priority (Tv) and Program, as well as Auto, Hybrid Auto, Scene, Movie, and a space marked as “C” which can be used for saving a group of custom settings - useful if you often find yourself shooting a particular type of scene. The inclusion of the latest Digic VII image processor means that continuous shooting times are much improved on the Canon PowerShot G9 X Mark II. When shooting JPEGs, the G9 X Mark II can shoot at 8.1fps for up to 38 shots, or 5.3fps with continuous auto-focusing for up to 102 shots. For Raw users, things get even better, with the G9 X Mark II capable of shooting at 8.2fps for up to 21 shots, a major improvement on the original G9 X's 0.8fps rate. 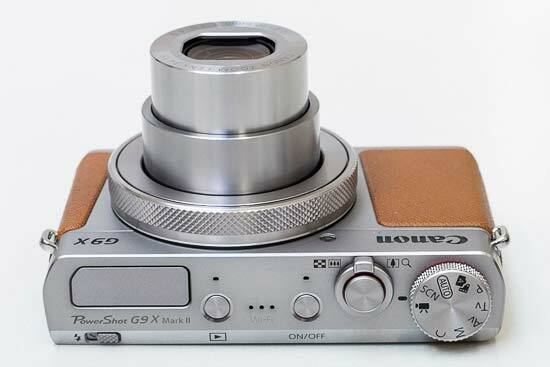 The zoom, at 3x, is quite modest, but the zoom switch moves the lens in and out smoothly and fluidly. If you have digital zoom enabled, it will pause ever so slightly before going into digital zoom territory, which is good for allowing you to keep an eye on only using the optical zoom if you wish. Finally, the Canon PowerShot G9 X Mark II's inbuilt flash can be found on the top plate. To raise it, there's a small switch found just underneath it. You push it back into the housing of the camera when you don't want to use it anymore. 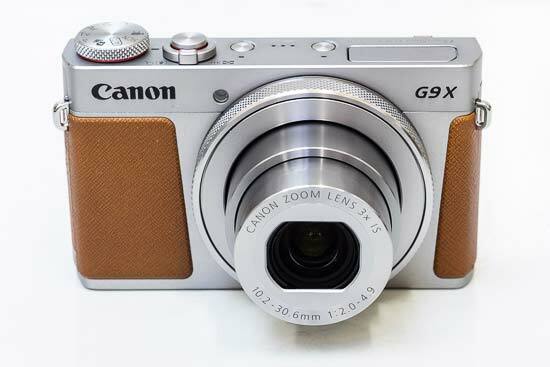 Moving to the back of the camera, most of it is taken up by the G9 X's three-inch touchscreen. However, there are four useful buttons just to the right hand side of the screen. There's a dedicated movie record button, a quick menu button, a main menu button and an info button. The info button changes the display of the back of the camera. The Q Set button also has a corresponding touchscreen button. Pressing the button, or tapping the icon on screen, will allow you to make changes to a group of commonly used settings, such as image quality, white balance, focusing type and so on. With no directional keys on the back of the camera, you'll need to use the touchscreen to make selections - if you're not a fan of touchscreens, you'll quickly get frustrated with the G9 X Mark II. Other common settings such as ISO, exposure compensation and aperture can also be changed via the touchscreen, with “buttons” along the bottom of the screen which can be tapped - you can then use a swiping motion along the screen to alter the setting, or, if you prefer, you can use the rotating control dial which is found around the lens (once a setting, i.e. exposure compensation is selected). It takes a little while to get used to navigating everything with the Canon PowerShot G9 X Mark II's touchscreen - perhaps especially because there are a few physical buttons on the side - however, once you do, it starts to become second nature. You can also set the focus point via the touchscreen - simply tap the area you want to use - since there are no directional keys, there's no other way to do this. It would be nice if you could customise the Quick menu to include options that you use frequently, and to remove the options you don't use all that often. The main menu button is used to access the more extensive menu, which again is navigated through using the touchscreen - it's a little more frustrating using the touchscreen for this action as menu items require a double press - but again it's something you get used to. Moving back to the control wheel around the front of the lens, it can be used for a variety of functions. When you're in aperture priority, by default it will control aperture, but there's a (touchscreen) button you can press to swap it from the default to exposure compensation or ISO, which can come in handy if you prefer to change those more often than aperture. In manual mode, you can swap between aperture, shutter speed and ISO. An interesting feature of the G9 X Mark II - and most Canon compact cameras - is Hybrid Auto. This takes a short (2 second) clip of video just before the shutter release is pressed and amalgamates all of the clips together at the end of a calendar day. The resulting video can be played back as a type of slideshow with the videos and still images. For most every day shooting scenarios it's not that useful, but for special events, such as weddings, parties or perhaps holidays it's a fun feature. It would be nice if you could have more control over it though - for example, if you could choose which photos make the final video, or if you could use it when shooting in other exposure modes. Creative photographers may want to use the Creative Shot mode. This takes an image and applies five different filters and crops. You don't get to choose exactly which filters or crops are used, but you can select from “Auto”, “Retro”, “Monochrome” and so on. Again it's a fun feature which can lead to some pleasing results, and with a clean JPEG too, you're not stuck with an unsatisfactory crop or filter if you don't like what the camera produces. There's a dedicated button for activating the camera's Wi-Fi on the side of the Canon PowerShot G9 X Mark II. Once you've pressed this, the name of the network you need to connect to from your smartphone or tablet will be displayed. Once connected, launch Canon's free Camera Window app and you can use your phone to take pictures, or download images already on the camera. There's a good degree of control you can take over what you can shoot, including aperture, zoom length, ISO, flash function, autofocus point and so on, which is nice to see. 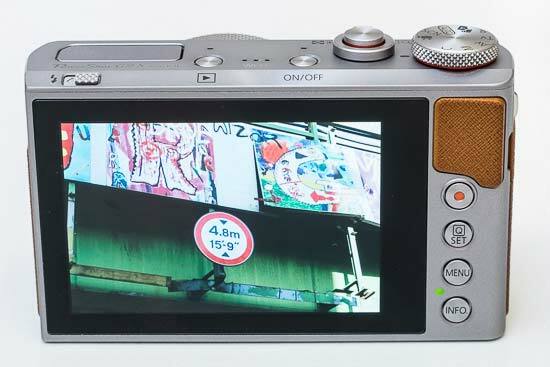 The new Bluetooth feature maintains a constant camera connection between the Canon PowerShot G9 X Mark II and a smart device, so you can see and share your photographs via a phone or tablet even when the G9 X II is turned off. You can also use a smart device for Wireless Remote Shooting. It's worth investing in a high speed Class 10 SD card to use with the G9 X Mark II as otherwise shot to shot times can be frustratingly slow (when using a Class 4 card for example). With a class 10, there's still a couple of seconds to wait before you can take another shot, but it shouldn't be a problem for most every day shooting scenarios. Focusing speeds are generally quick. The Canon PowerShot G9 X Mark II will hunt a little in lower light scenarios, but it's rare for a false positive to be presented. You can also get impressively close when macro focusing is activated for frame filling shots. Battery life has been slightly improved from 220 on the original G9 X to 235 shots per charge on the new Mark II version.